In just 11 days, the Civil Air Patrol (CAP) will meet for its big annual conference, the National Board (NB). When the lights go out on this one, the CAP’s national commander, Maj Gen Amy S. Courter’s term is over. Courter took over four years ago on the eve of an NB meeting when she got the announcement that her predecessor, Tony Pineda, was being suspended (and subsequently removed) for corruption. Pineda was out, but that left a lot of his people in place. MSgt Carr hasn’t really reached out to the membership much. On the other hand, the CAP’s members don’t vote, the NB (wing commanders on up) does. Perhaps, he is directing his campaign to the level at which it will be decided? A ranking member told us, “In recent years, a lot of votes are decided in the Meet-the-Candidates night.” But Gen Courter does believe in succession planning, we understand, and in mentoring and MSgt Carr has supported Maj Gen Courter through her last year, which is a great deal more than his predecessor, Brig Gen Reggie Chitwood, did. Lt Col Ray Hayden, of CAP Insights, doesn’t like either of the candidates for national vice commander, so if there were floor nominations for the vice commander’s position, then CAP Insights would go for either former CAP Florida Wing commander Col Chris Moersch or Reggie Chitwood. Col Moersch, in our experience, is a decent guy. But Reggie Chitwood? We seem to recall that in the last election, Chitwood solicited CAP Insights to support his campaign for national vice commander. And we seem to recall that when a little sun was shined on that, it helped to decide the election – and not in Chitwood’s favor. And wasn’t it decided that Chitwood could not keep his brigadier general’s rank after that caper? So you have to ask yourself why any other candidate would want CAP Insights’ endorsement and would want to link to its website. And you have to ask yourself if this means Weiss would, in turn, support CAP Insights’ vicious, personal attacks on the leadership, if Weiss believes Hayden should be hired for the governance work, and if, in general, Weiss thinks the world would be a much better place if Hayden ran it. Does this seem like a “Weiss decision” to you? 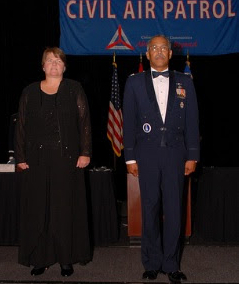 Be the first to comment on "MSgt Carr to be next National Commander"